Ancestral Pride ~ Husband and wife, mother and father, grandfather and grandmother, allies in solidarity with those are fighting for our rights to a future for our great great great grandchildren. Nothing more, nothing less, dedicated to our way of life, and to upholding the ways of our ancestors. One of the most important ideology’s that exist right now in “kkkanada” that we confront as Ancestral Pride and aim to dismantle, is the idea that Stephen Harper is ‘kkkanadas” problem and ousting him is the solution. This gives the false illusion that this “country” as an entity is just fine and working awesome as long as there is the right centralized leader who reflects the wants and needs of the average “citizen” than “kkkanada” is ok. This is of course an utter load of some of the most swallowed kool-aid in our collective consciousness! “kkkanada” the country is the problem, not whatever current puppet is sitting in the PM’s seat, this country and its current regime is based on genocide, blood shed, land theft, industrialization, oppression, and capitalism. “kkkanada” is an illegal entity, a military occupying force that has become so good at what it does that it has successfully lulled the masses into a false sense of security and patriotism, so much so that when the LIE is confronted in its enormity and glaring failures at humanity and justice people foam at their mouths to defend it. We do not romanticize our origins, world views, and way of life before contact BUT we do aim to point out that what we were doing worked. We existed here millennia beyond counting, without depleting or polluting our resources be it food, water, timber, or ore. We had protocols, responsibilities, and roles in our societies, and strove to live in a sustainable harmonious way that benefited all. Our connection to our bodies is the connection to our environment, what harmed our environment harmed us: “Hishuk Ish Tsawak ~ we are all ONE ~ connected” in order to sustain ourselves and to ensure the continuity of the future generations we lived and breathed balance. We listened to the world around us, the animals, the tides, the weather, the moon, the sun, the stars, the plants, and the air and we used ceremony and spirituality to keep our connection strong and open, in this way we followed the laws of our Creator, the laws of the land and the water, and the laws of our Tyee Hawiia our Hereditary Governance system! 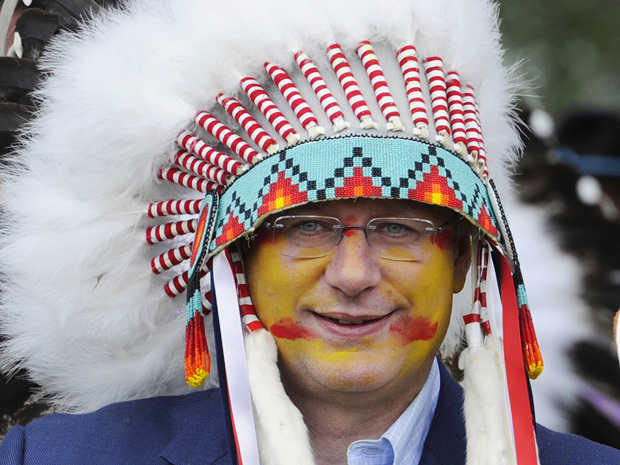 Harper wearing headdress supplied by Blood band council, 2011. This bio-regional based way of autonomously governing ourselves as Nations is integral to facilitating the way of the future for indigenous people as well as the un-settled settlers. Soon enough the wonton mass destruction of land, water, and life the colonizers are perpetuating by enslaving themselves to energy, consumption, and a technological way of life is coming to an abrupt and brutal end. Sooner than many believe because it is too scary to acknowledge. For these reasons alone we must dispel the new mythology of “kkkanada” and we must prepare in a meaningful way for a future that is going to be hard, fraught with peril, and will require extremely hard work to survive in. This is why it is of the utmost importance for everyone to understand that Stephen Harper is not the problem, whatever political party is considered bad is not the problem, this whole ‘kkkanadian government”, this society, this death culture, is the problem. Voting in a new “leader” will not work, voting in a new political “party” will not work, upholding ‘kkkanada” and its value systems based in systemic racism and oppression of the indigenous will not work, dismantling the very foundations of this spoiled privileged infant “country” is the only thing that will work. Moving away from a life based in energy consumption, a life based in slavery to survive, a life dependent on technology, and consumer goods is what will pave the way for our children, sacrifice will give them a chance. We are now as a species beyond the point of no return and we must work fast and hard to create a sustainable way of life that has a future free from the boot of the oppressor and the accompanying ecocide! It is with this in mind we have come to ask indigenous and non alike: What is your level of dedication? Where is your skill set? What can you offer a community? What will it take for you to commit to a new way of life? What does indigenous sovereignty mean to you? What are you willing to sacrifice? (settler) Are you ready to live as a citizen of the Nation of the lands you reside on? (indigenous) Are you ready to be a true contributing citizen of your Nation? How can you work to benefit the people? We have grave concerns about NOW, there is a need to organize in a manner beyond what we are comfortable with. Now is the time to train your predecessors, now is the time to make arrangements, now is the time sort your selves out mentally physically spiritually and emotionally, and now is the time to start organizing outside of the cities. Rallying, marching, raising awareness and all of the work that is important and vital to the struggle can be given over to those who have been waiting for their chance to get more involved and start learning. This is an exciting time, and one where those who are becoming more aware can start organizing and learning in earnest! We are all taking new steps together! Struggling with ego, and sense of self is one of most difficult tasks you can undertake as someone who feels compelled to enter into the realm of resistance, or revolution, is your ego getting in the way of the greater good? Is staying in the center of the organizing and the public praise that comes with it hard to give up? These are all things that must be examined, so that learning and growth can take place, it is hard and painful to confront yourself honestly, but it is rewarding and the insight is a gift. No one can tell you what to do, or make you do anything, this rite of passage in your growth as someone who would fight for our collective future and for Mother Earth is essential, this is a choice, a life style, a sacrifice, this is not a trend, a fad, or a fleeting moment of whimsy. For these reasons the desire to reach outside of yourself and look into your spirit must be your own, the change must be inspired by self and spirit. We all have our faults and our weak spots and this is why building a community of like minded people is important, so we can help each other, so we can support each other like the individual cells of a whole organism. There are many throughout history who forged a path and created space for themselves to learn how to be a new way. While the religious or other colonial aspects can be off putting, you have to admire the commitment and utter faith that groups like the Mormons, Hutterites, Amish, Mennonites, Quakers, and various sects of commune dwellers et al; have to their collective cause. The hippie movement of the 60′s seen a mass exodus of back to the landers, and you have to ask yourself: what is missing from our generation? Why are we not as committed to our collective vision? What is preventing us from moving forward out of the organizing rut and into a brand new world? The answer is many fold: technology, globalization, complacency, de/oppresion, apathy, are among a few of the factors that hold us back. We do not claim to have any answers, or to be above or ahead of anyone. We ask ourselves these same questions and are not exempt from examining our own motives and intentions in this movement. What we do have is an honest and heartfelt desire based in a feeling of urgency to create these spaces and live by our value systems as Ku us and Xulmux. Simply put it is not just pipelines, mines, logging, fish farms, and fracking, it is everything in this white privileged colonial society we must say NO to. Resoundingly, and with great conviction. Lets get building.